MANILA, Philippines - The 'April 2017 ECE, ECT board exam results' are officially released online on Friday, April 7 or in 3 working days after the exam. The Professional Regulation Commission (PRC) and the Board of Electronics Engineering (BEE) announced the complete list of passers, topnotchers (top 10), top performing schools and performance of schools. UPDATE: 1,033 out of 2,503 passed the Electronics Engineer Licensure Examination and 1,020 out of 1,273 passed the Electronics Technician Licensure Examination. PRC administered the first licensure exam for Electronics Engineers this year on April 2 and 3 for Electronics Engineer (ECE) and April 4 Electronics Technician (ECT) in the cities of Manila, Baguio, Cebu and Davao. The program for ECE board exam covered the following subjects: mathematics and electronics engineering on April 2; general engineering and applied sciences (GEAS) and electronics systems and technologies (EST) on April 3. Meanwhile, ECT exams on April 4 covered various technical subjects, laws and ethics. Based on PRC Resolution No. 2016- 1019, the target date of release of results for the recent Electronics Engineering board exam is on Friday, April 7 or in 3 working days after the last day of exam. Those who are monitoring ECE board exam result may check this page from time to time, ahead or beyond the target, due to possible unforeseen circumstances. In April 2016 exam, results were released in 3 working days after the exam. 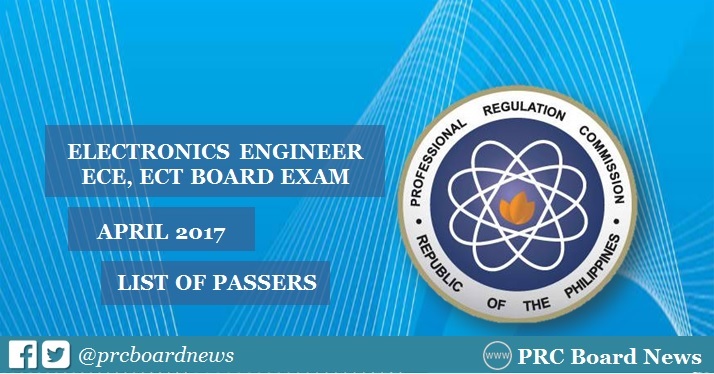 PRC named a total of 917 out of 2,482 who have passed the Electronics Engineer Licensure Examination and 985 out of 1,196 passers of the Electronics Technician Licensure Examination. In April 2015, results were out also in 3 working days. A total of 892 out of 2,552 successfully hurdled the ECE board exam and 1,066 out of 1,483 passed the ECT licensure examinations. For ECE, the usual national passing rate is on the range of 30-40% while 70-85% for ECT. According to Section 16 of R.A. 9292 or the "Electronics Engineering Law of 2004": To pass the licensure examination, a candidate for Electronics Engineer (ECE) or Electronics Technician (ECT) must obtain a passing rating of seventy percent (70%) in each subject given during the examination. This is provided, however, that a candidate who obtains a passing rating in the majority of the subjects but obtains a rating in the other subject/s below seventy percent (70%) but not lower than sixty percent (60%), shall be allowed to take one removal examination on the subject/s where he/she failed to obtain the passing rating. Finally, that should the examinee fail to obtain a passing rating in the removal examination, he/she shall be considered as having failed the entire licensure examination. Meanwhile, none of the schools qualified in the top performing list for April 2015 ECE board exam. De La Salle University (DLSU)-Manila, MIT and Adamson University aced the ECT board examination. PRC Board News will update this page for the list of passers, topnotchers and performance of schools. Bookmark this page or visit the official website of PRC for more information.